Are you living with the daily stress of debt hanging over your head? A forced savings plan may be the answer you’re looking for to regain control of your finances. It’s easier than you think to start taking positive steps towards getting out of debt. What is a forced savings plan? In personal finance, a forced savings plan can also be known as a commitment to invest. It is a series of automatic transfers that are in place to ensure your financial plan and investment strategy continue to run while all elements of your financial world are being accounted for. A forced savings plan is applicable for all people at all stages of their financial journey. 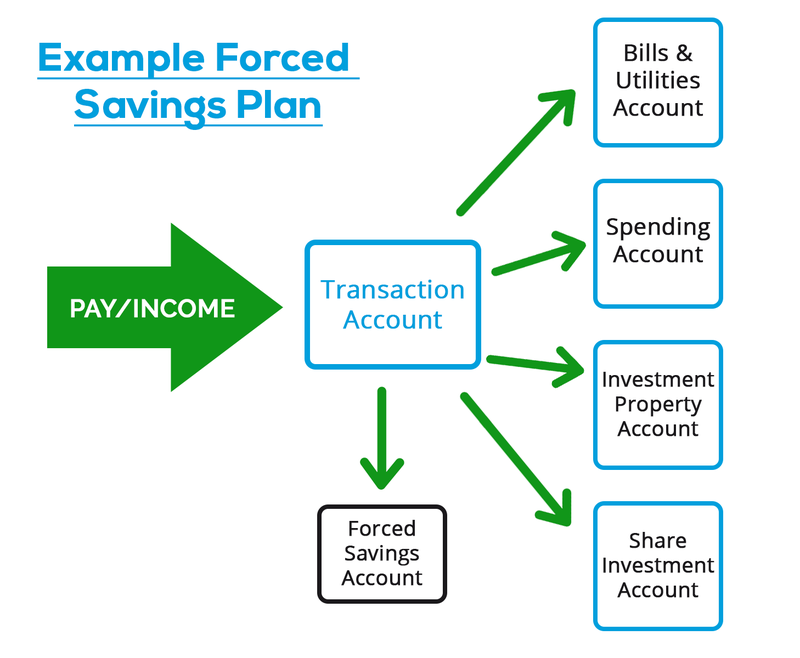 As outlined in the example below, a forced savings plan utilises a forced savings account that is set up with a completely different financial institution to your regular transaction and spending account. The right advice can show you the places in your monthly budget where you can afford to cut a few corners and keep more of your hard-earned money in the bank. Here are a few effective suggestions to get you started on a savings plan. Consider having a fixed amount of your salary or regular income automatically transferred into an online savings account. This should be a separate account from the one you use on a daily basis. By automating the process, you don’t need to worry about holding money aside for a savings plan. Even a few dollars a week will add up over time! Interest fees can eat away at your balance without you even realising. Loans and credit cards incur monthly fees, so your payments may only be covering the charges and interest, without making a big dent in your balance. Your priority should be to pay these debts off first. Seek advice from a financial expert to see whether you can roll your debts into one loan. This will consolidate the repayments and reduce interest and charges. Have you ever thought of paying a little extra to each utility or mobile bill every time they fall due? This idea of forced savings is clever and do-able. Consider overpaying your bills by a few dollars each month, and before you know it you will have accumulated a surplus. This may mean that eventually, you’ll have a month where the bill does not need to be paid at all, freeing up dollars from that month’s pay for other purposes. It sounds a little old-fashioned, but a basic ‘piggy bank’ approach can bring real rewards. Start putting your loose change into a jar or tin at the end of each day. Five cents will become five dollars before you know it. Make some of these simple changes to your financial routine and your a forced savings plan is off and running. Remember to take it slow and tinker with the ideas until you have a system in place that works for you. If in doubt, chat with a financial advisor who can give you many more bright ideas for taking control of your money. Being better at saving money is something that most people desire. This guide is a great place to start improving!